Vintage Washington map from a 1911 Encyclopedia. It was the 42nd state admitted to the Union in 1899. In 1900, Washington state had a population of around 1,141,990. A little more than 21% of the population, at that time, were the children of foreign-born parents; primarily German, Swedish, Irish, Norwegian and English. In 2016, the population was estimated by 7,288,000. It’s the 13th most-populated state. It’s estimated that 1 of 7 Washington residents was foreign-born and 1 of 8 are American born of one or more foreign-born parents. Almost 60% of Washingtonians live in the Seattle metropolitan area. It’s a stunningly beautiful state. Much of the state has remained in its natural state with deep temperate rainforests, mountain ranges and a semi-arid basin region. It’s also home to Mount Rainier, an active stratovolcano. They are the biggest producer of much of America’s fruit including apples, hops, pears, red raspberries, spearmint oil and sweet cherries. They also rank high in the production of apricots, asparagus, dry edible peas, grapes, lentils, peppermint oil and potatoes. Their primary industries include the manufacture of aircraft, shipbuilding and other machinery. Columbia was the original name they planned to use for the state. However, Kentucky representative Richard H. Stanton suggested the original name for the new state of “Columbia” was too similar to our nation’s capital and proposed the state be named after President Washington. Washington has the honor of being the only state named after a president. 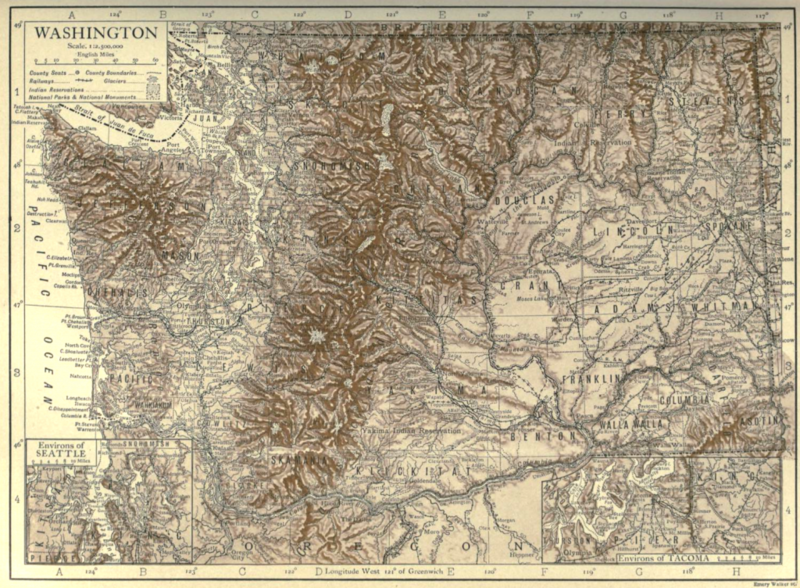 The largest version of this vintage Washington Map doesn’t display well within the confines of my site layout. Simply click on the map shown above to view the full-sized version.